Agomelatine (BAN, rINN; trade names Valdoxan, Melitor, Thymanax) is a melatonergic antidepressant developed by the pharmaceutical company Servier. It is marketed for the treatment of major depressive disorder and has been reported not to produce discontinuation syndrome or sexual side effects (compared to SSRIs, SNRIs and the older tricyclic antidepressants). Agomelatine may also encourage restful sleep and improve cognition. Agomelatine was discovered and developed by the European pharmaceutical company Servier Laboratories Ltd. Servier continued to develop the drug and conduct phase III trials in the European Union. In March 2005, Servier submitted agomelatine to the European Medicines Agency (EMA) under the trade names Valdoxan and Thymanax. On 27 July 2006, the Committee for Medical Products for Human Use (CHMP) of the EMA recommended a refusal of the marketing authorisation. The major concern was that efficacy had not been sufficiently shown, while there were no special concerns about side effects. In September 2007, Servier submitted a new marketing application to the EMA. In March 2006, Servier announced it had sold the rights to market agomelatine in the United States to Novartis. It was undergoing several phase III clinical trials in the US, and until October 2011 Novartis listed the drug as scheduled for submission to the FDA no earlier than 2012. However, the development for the US market was discontinued in October 2011, when the results from the last of those trials became available. It received EMA approval for marketing in the European Union in February 2009 and TGA approval for marketing in Australia in August 2010. Agomelatine is indicated for the treatment of major depressive episodes in adults. Ten placebo controlled trials have been performed to investigate the short term efficacy of agomelatine in major depressive disorder. At the end of treatment, significant efficacy was demonstrated in six of the ten short-term double-blind placebo-controlled studies. Two were considered "failed" trials, as comparators of established efficacy failed to differentiate from placebo. Efficacy was also observed in more severely depressed patients in all positive placebo-controlled studies. The maintenance of antidepressant efficacy was demonstrated in a relapse prevention study. Results of the meta-analysis of three positive, randomized, double-blind, placebo controlled studies in 357 patients treated with agomelatine and 360 patients treated with placebo show that agomelatine is effective in treating severe depression. Its antidepressant effect is greater for more severe depression. In patients with a greater Baseline (pharmacology) score (>30 on HAMD17 scale), the agomelatine-placebo difference was of 4.53 points. Controlled studies in humans have shown that agomelatine is at least as effective as the SSRI antidepressants paroxetine, sertraline, escitalopram, venlafaxine and fluoxetine in the treatment of major depression. A large meta-analysis of 20 trials with 7460 participants found agomelatine to be as effective as standard antidepressants. A small open-label study has suggested efficacy in the treatment of atypical and melancholic depression. Well-designed clinical trials have demonstrated efficacy in the treatment of anxious depression. Agomelatine’s onset of action has been reported to occur as early as the first week of treatment. Additionally, possibly because of its action on melatonin receptors, agomelatine appears to improve sleep quality, with no reported daytime drowsiness. Agomelatine has demonstrated anxiolytic properties in rodents. It has been found significantly more effective than placebo in the treatment of generalised anxiety disorder. There is tentative evidence to suggest the efficacy of agomelatine as either a monotherapy or adjunct in the treatment of obsessive-compulsive disorder (OCD). A case report documenting the efficacy of agomelatine in the treatment of social anxiety disorder has been published. An open-label study has found agomelatine to be efficacious in the treatment of seasonal affective disorder. Open-label studies have suggested efficacy of adjunctive agomelatine in bipolar depression. A study in mice found that protected against pentylenetetrazole- and pilocarpine-induced seizures. A small placebo-controlled trial found some benefit of agomelatine in attention deficit hyperactivity disorder (ADHD). It is not recommended for use in children and adolescents below 18 years of age due to a lack of data on safety and efficacy. Only limited clinical data is available on the use of agomelatine in elderly patients ≥ 65 years old with major depressive episodes. Therefore, caution should be exercised when prescribing it to these patients. Agomelatine does not alter daytime vigilance and memory in healthy volunteers. In depressed patients, treatment with the drug increased slow wave sleep without modification of REM (Rapid Eye Movement) sleep amount or REM latency. Agomelatine also induced an advance of the time of sleep onset and of minimum heart rate. From the first week of treatment, onset of sleep and the quality of sleep were significantly improved without daytime clumsiness as assessed by patients. Agomelatine appears to cause fewer sexual side effects and discontinuation effects than paroxetine. It appears better tolerated than the SSRIs. Note: mania and hypomania are often due to an underlying disease, namely bipolar disorder. Agomelatine is contraindicated in patients with kidney or liver impairment. According to information disclosed by Les Laboratoires Servier on October 10, 2012, guidelines for the follow-up of patients treated with Valdoxan have been modified in concert with the European Medicines Agency. As some patients may experience increased levels of liver enzymes in their blood during treatment with Valdoxan, doctors have to run laboratory tests to check that the liver is working properly at the initiation of the treatment and then periodically during treatment, and subsequently decided whether pursue the treatment or not. No relevant modification in agomelatine pharmacokinetic parameters in patients with severe renal impairment has been observed. However, only limited clinical data on its use in depressed patients with severe or moderate renal impairment with major depressive episodes is available. Therefore, caution should be exercised when prescribing agomelatine to these patients. 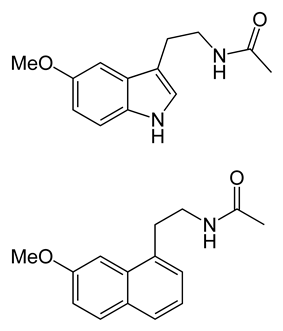 Agomelatine is a substrate of CYP1A2, CYP2C9 and CYP2C19 and hence CYP1A2, CYP2C9 and CYP2C19 inhibitors (e.g. the SSRI antidepressant, fluvoxamine) reduce its clearance and can hence lead to an increase in agomelatine exposure. There is also the potential for agomelatine to interact with alcohol to increase the risk of hepatotoxicity (liver toxicity). Agomelatine is expected to be relatively safe in overdose. No dosage tapering is needed on treatment discontinuation. Agomelatine has no abuse potential as measured in healthy volunteer studies. The chemical structure of agomelatine is very similar to that of melatonin. Where melatonin has an NH group, agomelatine has an HC=CH group. Thus melatonin contains an indole part, whereas agomelatine has a naphthalene bioisostere instead. Agomelatine is a melatonin receptor agonist (MT1 (Ki=0.1nM) and MT2 (Ki=0.12nM)) and a 5-HT2C (Ki=631nM) receptor antagonist. Binding studies indicate that it has no effect on monoamine uptake and no affinity for adrenergic, histaminergic, cholinergic, dopaminergic and benzodiazepine receptors, nor other serotonergic receptors. Agomelatine resynchronises circadian rhythms in animal models of delayed sleep phase syndrome. By antagonizing 5-HT2C receptors, it disinhibits/increases noradrenaline and dopamine release specifically in the frontal cortex. Therefore, it is sometimes classified as a norepinephrine–dopamine disinhibitor. It has no influence on the extracellular levels of serotonin. Agomelatine has shown an antidepressant-like effect in animal models of depression (learned helplessness test, despair test, chronic mild stress) as well as in models with circadian rhythm desynchronisation and in models related to stress and anxiety. In humans, agomelatine has positive phase shifting properties; it induces a phase advance of sleep, body temperature decline and melatonin onset. 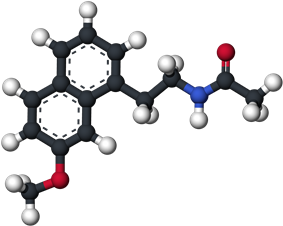 Melatoninergic agonist and selective serotonin 5-HT2B and 5-HT2C receptor antagonist; metabolically stable analogue of melatonin, q.v. ^ a b c d e f g h i j k l m n "VALDOXAN® Product Information" (PDF). TGA eBusiness Services. Servier Laboratories Pty Ltd. 2013-09-23. Retrieved 2013-10-14. ^ a b "Questions and Answers on Recommendation for Refusal of Marketing Authorisation" (PDF). ^ "CHMP Assessment Report for Valdoxan" (PDF). European Medicines Agency. 20 November 2008. Retrieved 6 July 2009. ^ Bentham, Clara (2006-03-29). "Servier and Novartis sign licensing agreement for agomelatine, a novel treatment for depression". Servier UK. Archived from the original on 16 April 2009. Retrieved 2009-05-15. ^ "Clinical trials for agomelatine". ^ Novartis drops future blockbuster agomelatine. Scrip Intelligence, Oct 25 2011 (retrieved Oct 30, 2011). ^ a b c d e f g h i j k l m n o p q "Summary of Product Characteristics" (PDF). European Medicine Agency. Retrieved 2013-10-14. ^ Montgomery, SA; Kasper, S (September 2007). "Severe depression and antidepressants: focus on a pooled analysis of placebo-controlled studies on agomelatine.". Int Clin Psychopharmacol. 22 (5): 283–91. ^ Kasper S, Hajak G, Wulff K, Hoogendijk WJ, Montejo AL, Smeraldi E, Rybakowski JK, Quera-Salva MA, Wirz-Justice AM, Picarel-Blanchot F, Baylé FJ (February 2010). "Efficacy of the novel antidepressant agomelatine on the circadian rest-activity cycle and depressive and anxiety symptoms in patients with major depressive disorder: a randomized, double-blind comparison with sertraline". J Clin Psychiatry 71 (2): 109–20. ^ a b Demyttenaere, K; Corruble, E; Hale, A; Quera-Salva, MA; Picarel-Blanchot, F; Kasper, S (June 2013). "A pooled analysis of six month comparative efﬁcacy and tolerability in four randomized clinical trials: agomelatine versus escitalopram, ﬂuoxetine, and sertraline" (PDF). CNS Spectrums 18 (3): 163–170. ^ Singh, SP; Sing, V; Kar, N (April 2012). "Eﬃcacy of agomelatine in major depressive disorder: meta-analysis and appraisal". International Journal of Neuropsychopharmacology 15 (3): 417–428. ^ Taylor, D.; Sparshatt, A.; Varma, S.; Olofinjana, O. (2014). "Antidepressant efficacy of agomelatine: Meta-analysis of published and unpublished studies". BMJ 348: g1888. ^ Avedisova, A; Marachev, M (2013). "2639 – The effectiveness of agomelatine (valdoxan) in the treatment of atypical depression". European Psychiatry 28 (Suppl. 1): 1. ^ Heun, R; Coral, RM; Ahokas, A; Nicolini, H; Teixeira, JM, Dehelean, P (2013). "1643 – Efficacy of agomelatine in more anxious elderly depressed patients. A randomized, double-blind study vs placebo". European Psychiatry 28 (Suppl. 1): 1. ^ Stein, DJ; Picarel-Blanchot, F; Kennedy, SH (March 2013). "Efficacy of the novel antidepressant agomelatine for anxiety symptoms in major depression". Human Psychopharmacology: Clinical and Experimental 28 (2): 151–159. ^ Lemoine, P; Guilleminault, C; Alvarez, E (November 2007). "Improvement in subjective sleep in major depressive disorder with a novel antidepressant, agomelatine: randomized, double-blind comparison with venlafaxine.". J Clin Psychiatry 68 (11): 1723–32. ^ "Valdoxan: A New Approach to The Treatment of Depression". Medical News Today (MediLexicon International Ltd). 2005-04-05. Archived from the original on 15 April 2009. Retrieved 14 May 2009. ^ Millan MJ, Brocco M, Gobert A, Dekeyne A (February 2005). "Anxiolytic properties of agomelatine, an antidepressant with melatoninergic and serotonergic properties: role of 5-HT2C receptor blockade". Psychopharmacology (Berl.) 177 (4): 448–58. ^ De Berardis, D; Conti, CM; Marini, S; Ferri, F; Iasevoli, F; Valchera, A; Fornaro, M; Cavuto, M; Srinivasan, V; Perna, G; Carano, A; Piersanti, M; Martinotti, G; Di Giannantonio, M (2013). "Is there a role for agomelatine in the treatment of anxiety disorders? a review of published data". International Journal of Immunopathology and Pharmacology 26 (2): 299–304. ^ Fornaro, M (February 2011). "Switching from serotonin reuptake inhibitors to agomelatine in patients with refractory obsessive-compulsive disorder: a 3 month follow-up case series". Annals of General Psychiatry 10 (1): 5. ^ De Berardis, D (2012). "Agomelatine augmentation of escitalopram therapy in treatment-resistant obsessive-compulsive disorder: a case report" (PDF). Case Reports in Psychiatry 2012: 1. ^ De Berardis, D; Serroni, N; Campanella, D; Olivieri, L; Moschetta, FS; Conti, CM; Conti, P; Di Giannantonio, M (April 2012). "A case of obsessive-compulsive disorder successfully treated with agomelatine monotherapy". Journal of Clinical Psychopharmacology 32 (2): 289–290. ^ Bhutada, P; Dixit, P; Thakur, K; Deshmukh, P; Kaulaskar, S (July 2013). "Effects of agomelatine in a murine model of obsessive–compulsive disorder: Interaction with meta-chlorophenylpiperazine, bicuculline, and diazepam". The Kaohsiung Journal of Medical Sciences 29 (7): 362–367. ^ Crippa, JA; Hallak, JE; Zuardi, AW; Chagas, MH; Quevedo, J; Nardi, AE (October 2010). "Agomelatine in the treatment of social anxiety disorder". Progress in Neuro-Psychopharmacology and Biological Psychiatry 34 (7): 1357–1358. ^ Pjrek, E; Winkler, D; Konstantinidis, A; Willeit, M; Praschak-Rieder, N; Kasper, S (March 2007). "Agomelatine in the treatment of seasonal affective disorder". Psychopharmacology 190 (4): 575–579. ^ Fornaro, M; McCarthy, MJ; De Berardis, D; De Pasquale, C; Tabaton, M; Martino, M; Colicchio, S; Cattaneo, CI; D'Angelo, E; Fornaro, P (2013). "Adjunctive agomelatine therapy in the treatment of acute bipolar II depression: a preliminary open label study". Neuropsychiatric Disease and Treatment 9: 243–251. ^ Calabrese, JR; Guelfi, JD; Perdrizet-Chevallier, C (September 2007). "Agomelatine adjunctive therapy for acute bipolar depression: preliminary open data". Bipolar Disorders 9 (6): 628–635. ^ Aguiar, CC; Almeida, AB; Araújo, PV; Vasconcelos, GS; Chaves, EM; do Vale, OC; Macêdo, DS; de Sousa, FC; Viana, GS; Vasconcelos, SM (July 2012). "Anticonvulsant effects of agomelatine in mice". Epilepsy & Behavior 24 (3): 324–328. ^ Niederhofer, H (May 2012). "Treating ADHD with Agomelatine". Journal of Attention Disorders 16 (4): 346–348. ^ a b c d e Australian Medicines Handbook 2013. Adelaide: The Australian Medicines Handbook Unit Trust. 2013. ^ a b c Joint Formulary Committee and Royal Pharmaceutical Society of Great Britain (2013). British National Formulary (BNF) 65. London, UK: Pharmaceutical Press. p. 253. ^ Kennedy, SH; Rizvi, SJ (June 2010). "Agomelatine in the Treatment of Major Depressive Disorder Potential for Clinical Effectiveness". CNS Drugs 24 (6): 479–499. ^ Taylor, D; Paton, C; Shitij, K (2012). The Maudsley prescribing guidelines in psychiatry. West Sussex: Wiley-Blackwell. ^ B. Tinant, J.-P. Declercq, J. H. Poupaert, S. Yous, D. Lesieur (1994). "N-[2-(7-Methoxy-1-naphthyl)ethyl]acetamide, a potent melatonin analog". ^ Dridi, D; Zouiten, A; Mansour, HB (June 2013). "Depression: chronophysiology and chronotherapy". Biological Rhythm Research 45: 1–15. ^ Le Strat, Y; Philip Gorwood (27 August 2008). "Agomelatine, an innovative pharmacological response to unmet needs". J Psychopharmacol (SagePub) 22 (7): suppl 4–8.